The U.S. military has always been fertile soil for firsts throughout our nation’s history, and the promotion of Carol A. Mutter to become the nation’s first female lieutenant general serves as a perfect case in point for Women’s History Month. Women have served in the military from the earliest years of our representative republic. Deborah Sampson (Gannett) served covertly when she disguised herself as a man under the assumed name of Robert Shurtleff, to join the Continental Army and fight in the Revolutionary War in 1782. Sampson went so far as to cut a musket ball out of her own thigh to prevent a battlefield surgeon from discovering her true gender. She was honorably discharged as a private in 1793. Women gained the opportunity to serve openly in World War I when Congress opened the military to women in 1914. However, it took more than two centuries between the time Sampson first shouldered a musket to the time when women served as general (flag rank) officers in the American military. Mutter achieved one-star brigadier general rank in 1991. Three years later Mutter became the first woman in the history of America’s military to achieve two-star major general rank in 1994, and two years after that in 1996 she became the first woman to become a three-star lieutenant general in any American military branch. 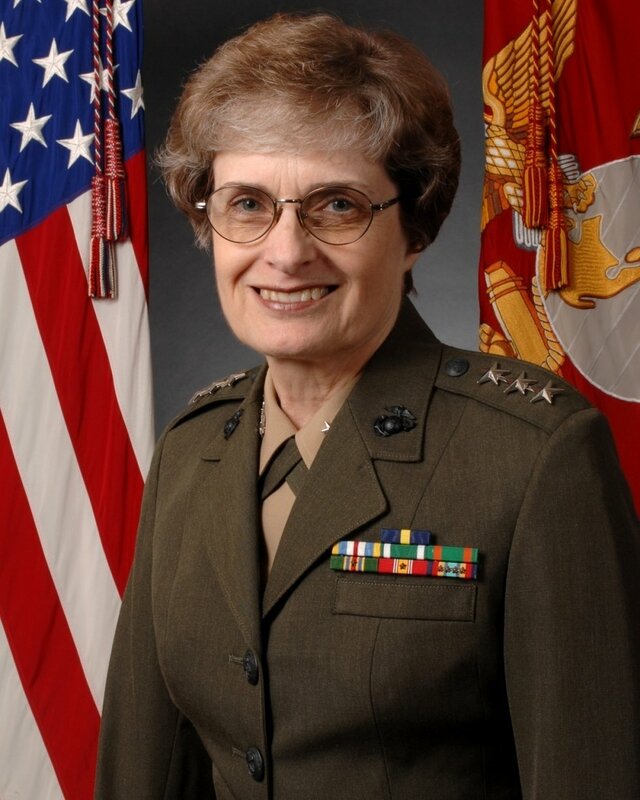 Lieutenant General Carol A. Mutter, Marine Corps, was the first woman in the U.S. military to achieve the rank of three star general. Born in 1945 in Greeley, Colorado, Mutter graduated in 1967 from officer candidate school at the University of Northern Colorado as a second lieutenant in the Marine Corps. First woman to qualify as Command Center Crew Commander/Space Director at U.S. Space Command. First woman of flag rank (general officer rank) to command a major deployable tactical command. First woman Marine major general, and senior woman in all the services at that time. First woman nominated by a U.S. president (Bill Clinton) for three-star rank. First female lieutenant general in the U.S. Armed Forces. During a 2014 interview for the documentary Unsung Heroes: The Story of America’s Female Patriots, Mutter explains why she joined the Marine Corps during the early years of the Vietnam War. The general has been recognized as a trailblazer by several different organizations. Among them is the National Women’s Hall of Fame which inducted the general in 2017. Mutter retired from the Corps in 1999 and lives with her husband at their home in Lookout Mountain, Tennessee.